Prime Minister Narendra Modi’s Swachch Bharat campaign reached Varanasi’s Assi ghat today where he symbolically removed silt to clean Ganga and the attached ghat, converging two of his dream projects — Clean India and Clean Ganga. With the Maharashtra Government planning huge investments in Mumbai’s infrastructure, Chief Minister Devendra Fadnavis has mooted the idea of a Chief Executive Officer (CEO) for Mumbai who will directly report to him. Laxmikant Parsekar’s strong RSS links and deep loyalty for the party today effectively blunted the challenge posed by Deputy Chief Minister Francis D'Souza, resulting in his anointment as the new Chief Minister of Goa. Already at a historical low in the Lok Sabha, the Congress now faces the challenge of a regrouped Janata Dal family, which is all set to work itself up as an alternative opposition in Parliament. TNCC chief EVKS Elangovan today virtually censured Karti Chidambaram, son of former Union minister P Chidambaram, for his controversial remarks against party high command observers saying such opinions could be expressed within the party fora and not in the media. The National Investigation Agency, which is looking into the Khagraghar blast in Burdwan, will send a team to Dhaka tomorrow to interrogate one of the prime accused, Abdul Nur. To keep up with changing business practices and advancements in financial transaction procedures, the Army has drawn up a plan for revamping and automating the system of accounting and payments in the Military Engineer Services (MES). Claiming that people were impressed with the performance of Narendra Modi Government, senior BJP leader and Union Minister Prakash Javadekar today said the party plans to induct 10 crore new members across the country by March 31. India today asserted that there can be no justification for terror acts and said it was fully committed to the policy of zero tolerance against terrorism. Fresh from her emphatic re-election, South Carolina’s Governor Nikki Haley will visit India next week to bring investment and promote her state as a tourist destination in her parents’ native country. Efforts were being made to file an appeal on November 10 in the Sri Lankan Supreme Court challenging the death sentence awarded to five Indian fishermen. The Tamil Nadu Government has sent Rs 20 lakh for meeting the legal expenses. Tension prevailed in some localities of Thane, 35 km from Mumbai, after Republican Party of India (RPI) activists took to the streets over an allegedly defamatory post of Dalit icon Babasaheb Ambedkar today, police said. The hope to find alive four Navy personnel who have been missing since Thursday night’s accident in the Bay of Bengal is fading fast. The Navy has deployed nine warships and specialised search planes to locate the four personnel. The final version of the two-seater trainer jet Tejas (PV-6) made its maiden flight today, in a milestone for India's overall indigenous Light Combat Aircraft programme. A Deputy Superintendent of Police-rank officer, leading a Meghalaya Police team, was injured when they were fired upon by Assam policemen who mistook them for militants in a remote village in West Jaintia Hills district today, a top police official said here. He also co-opted Uttar Pradesh Chief Minister Akhilesh Yadav and eight other celebrities from the state to push the cleanliness drive forward. On the concluding day of his two-day visit to his parliamentary constituency, Modi arrived at the already sanitised and freshly scrubbed ghat early in the morning. 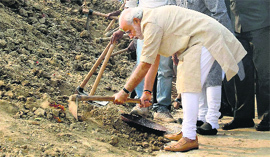 Amid chanting of ‘har har mahadev’ by the supporters who had gathered en route to the venue, Modi first performed Ganga pujan and then without much ado picked up a spade to dig out silt from the river. He vigorously dug out silt from the river filling basket after basket. Addressing the media, Modi declared that he had decided to nominate nine people to carry forward the cleanliness campaign in the state. Besides CM Akhilesh Yadav, those nominated are: North West Delhi BJP MP and Bhojpuri actor-singer Manoj Tiwari, standup comedian Raju Srivastava who had joined the BJP during the Lok Sabha elections, singer Kailash Kher, cricketers Mohammad Kaif and Suresh Raina, Swami Rambhadracharya, Chancellor of Jagadguru Rambhadracharya Handicapped University in Chitrakoot, writer Manu Sharma (best known for his book – Krishn Ki Atmakatha) and noted Sanskrit scholar Devi Prasad Dwivedi. He also shared a number of plans for the city's modernisation which included battery-operated cars as modes of public transport, door-to-door garbage collection and a "Palace on Wheels" train running from Delhi to Varanasi via Ayodhya and Prayag. The Prime Minister also said that he wants the entire sprawling campus of Benares Hindu University to be converted into a Wi-Fi zone and to ensure that every school of Varanasi had separate toilets for boys and girls. He also said that he wished to transform the ghats of Varanasi into a major tourist attraction with the help of cleanliness and state-of-the art illumination technology. According to the plan suggested by Fadnavis, the CEO, holding a rank of Additional Chief Secretary just below the Chief Secretary, would be based at Mantralaya — the secretariat of the state government. “The CEO will fast-track developmental projects and help co-ordinate between various departments,” Fadnavis had told reporters last week. there is the Mumbai Metropolitan Region Development Authority and various departments of the state government. Department and the Chief Secretary must directly solve Mumbai’s problems instead of appointing one more person,” Shiv Sena leader Rahul Shewale told reporters here. Shiv Sena mouthpiece Saamna in a write-up alleged that the move to appoint a CEO for Mumbai was the first step in separating Mumbai from Maharashtra. However, the BJP has attacked the Shiv Sena saying it was disinterested in improving Mumbai and was only interested in the financial benefits accruing from running the city. The 58-year-old MLA from Mandrem was administered the oath of office and secrecy by Governor Mridula Sinha along with nine other ministers — seven from BJP and two from its alliance partner Maharashtrawadi Gomantak Party (MGP). The BJP’s Parliamentary Board, which met in New Delhi this morning in the absence of Prime Minister Narendra Modi approved the name of Parsekar, who was then unanimously elected the leader of the BJP legislature party in Goa. The highest decision making body of the party also approved for his predecessor Manohar Parrikar the nomination for a Rajya Sabha seat from Uttar Pradesh. Rewarded for his die-hard loyalty to the party, Pareskar was administered the oath of office and secrecy in time before Parrikar left for the Capital to make way into Modi’s council of ministers on Sunday. The state BJP which suffered the threat of a rebellion at the hands of D'Souza, who yesterday challenged the party’s decision to “supersede him with a junior” today seconded Parrekar's proposal of Pareskar’s name as the leader of the party's legislature wing. The sources said that apart from solid backing by Parrikar, Pareskar was also being supported by secretary (organisation) Satish Dhond. In spite of such strong support from former CM and the RSS, sources said it took two days of hectic deliberations, a series of meetings with MLAs and contenders to ensure a happy ending in the beach state. Announcing the decision the central emissary Rajiv Pratap Rudy said Parsekar's name was elected the leader of the party's legislature wing "unanimously". Parrikar proposed Parsekar’s name which was seconded by D'Souza, he said. Notably, D’Souza, the man who created a storm by threatening to walk out if he was overlooked today appeared composed and relaxed. He said that yesterday it appeared as if Pareskar had been nominated by the party-a feeling which was dispelled after the “democratic process” carried out by the party. “Yesterday, the chief minister was being nominated. Today he has been elected by the 21 MLAs…. I cannot be upset with an election process. When there is an election and majority of MLAs vote for him, how can I be upset,” D’Souza said. The newfound bonhomie between the erstwhile members of the “Janata Dal Parivar” is bothering the Congress for another reason – they will eat into the non-BJP vote banks which have traditionally seen the Congress as an option. Senior strategists of the Congress today acknowledged that the development was serious and “would dent the Congress structure and prospects further” especially in Uttar Pradesh and Bihar which command 120 seats in the Lok Sabha. “We have already suffered a huge defeat in the Lok Sabha. This regrouping will deal another blow to us. Our wounds will deepen further for the simple reason that this new combination of forces will target support bases which have traditionally leaned towards us,” said a top party leader, adding that the Congress would need to think ahead to neutralise the challenge of the development considering the Bihar elections are due in 2015 and Uttar Pradesh in 2016. Privately, many leaders advocate a go-alone policy in elections as a long term strategy to revive the near dead Congress structures in states – a trend evidenced in LS results in which the party wrapped up under two digits in most states. In the recent Bihar Assembly byelections on 10 seats where the Congress played a third fiddle to Lalu Yadav’s RJD and Nitish Kumar’s JDU, it lost much political ground. The RJD and JDU fought four seats each out of 10 while the Congress settled for two and won only one. They believe the policy of coalitions has harmed the interest of the party and it needed to be revisited in the current scenario. The party should go alone and struggle among people to create its own base, they said. 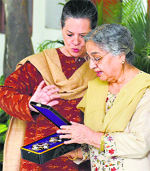 “If someone has hesitancy in expressing their views to me, they are free to go to party president Sonia Gandhi herself. But it will not be appropriate to discuss party issues in the media,” he said. Firing a salvo at the AICC leadership after senior leader GK Vasan quit the party, Karti, an AICC member, had disapproved of role of high command’s observers in managing affairs of party state units and expressed the view that a Kerala model would best be sutied for the TNCC. The Bangladesh police recently arrested Nur in connection with Jamaat-ul-Mujahideen Bangladesh conspiracy to kill Bangladesh Prime Minister Sheikh Hashia, Opposition leader Khaleda Zia and other important persons. 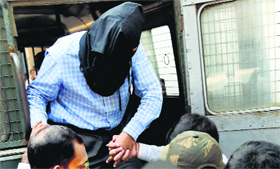 The City metropolitan court today remanded Zia-ul-Haque in seven-day NIA custody. A madrasa teacher by profession, Haque was stated to be an agent of Khagraghar blast mastermind and prime accused Asiq Molla, who is still at large. The NIA officials, who arrested Haque from his rented house at Burdwan last night, told the court that they needed to further interrogate Haque to unravel the Jamaat-ul-Mujahideen Bangladesh’s conspiracy to destabilise the democratic setup of Bangladesh. The plan was being hatched in Burdwan. According to a proposal circulated to various establishments, the Engineer-in-Chief’s (E-in-C) Branch at Army Headquarters has proposed “clear and fast” payments directly to contractors by garrison engineers through internet banking instead of issuing cheques through banks, which can be time-consuming. Though e-tendering for contracts now in practice with documents being submitted online, earnest money has to be deposited physically through demand draft. The E-in-C Branch has sought deposit of earnest money online on the same lines as the railway ticket booking system, where the deposit of unsuccessful bidders can also be remitted back online. It has also been proposed that since certain stipulated documents are stored online for 15 years and can be downloaded anytime, the need for submitting original tendering documents can be dispensed with. Similarly, there is no need to prepare physical comparative charts and the same data can be generated electronically. One of the three major components of the Corps of Engineers, MES is responsible for the construction and maintenance of military infrastructure and other defence operational support structures that require civil works. With an annual budget of over Rs 9,000 crore, it is one of the world’s largest construction agencies and draws its manpower from the armed forces as well as a civilian cadre. "Our target is to get ten crore new members across the country this time as against over 3.5 crore enrolled last time during 2010-11. We are confident of achieving the set number as people are with us," Javadekar told reporters here after launching BJP's membership drive in Odisha. Javadekar, who is Environment and Forest and Information and Broadcasting Minister, said since BJP's vote share has gone up to 18 crore this time from around 8 crore in previous polls, inducting 10 crore members during the drive slated to continue up to March 31 should not be tough. Stating that 80 per cent of Lok Sabha seats reserved for STs and SCs were won by BJP, the party stalwart said it showed that poor, Dalits, backward classes and economically weaker sections were eager to rise and achieve development under the leadership of Modi. Participating in the 9th meeting of the Advisory Board of the United Nations Counter-Terrorism Center (UNCCT), India’s Permanent Representative to the UN Asoke Mukerji urged the UN body to continue its efforts towards balanced implementation of the four pillars of the Global Counter Terrorism Strategy. The pillars are: addressing conditions conducive to the spread of terrorism, preventing and combating terrorism, building states’ capacity to prevent and combat terrorism and strengthen the UN system’s role in this regard and ensuring respect for human rights. “India on its part is fully committed to the policy of zero tolerance against terrorism and firmly believes there can be no justification for terrorist acts,” Mukerji said here yesterday. 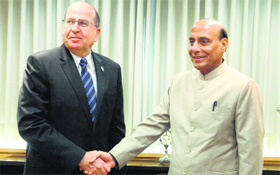 India voiced its support to the idea of investing in understanding the Foreign Terrorist Fighters phenomenon. Mukerji proposed that a discussion paper be circulated to the board to enable its members to have an action oriented discussion on the issue. Mukerji also welcomed the suggestion of UN Secretary General Ban Ki-moon of providing the expertise of the UNCCT to the UN peacekeeping operations, particularly those that have been directly affected by terrorist acts. He extended India’s support to the capacity building of the UNCCT in regions most affected by terrorism. During the 10-day trip beginning November 11, Haley and her delegation are scheduled to have as many as 90 meetings in New Delhi, Hyderabad, Amritsar, Mumbai and Chennai. “Next week, the State of South Carolina is launching our first trade and investment mission to India,” Secretary of Commerce Bobby Hitt said yesterday. The delegation includes Commerce personnel, the state’s Department of Parks, Recreation and Tourism, private-sector economic development allies and several South Carolina-based companies looking to make export connections, he said. “The goal of the trip is to put South Carolina on the map with Indian businesses. We will be introducing the advantages of doing business in South Carolina to Indian companies in order to enhance our trade ties and to encourage domestic investment by Indian companies,” Hitt said. During the visit, Haley would also be positioning South Carolina as a top tourism destination. India sends one of the largest numbers of tourists to the US, but a small fraction of them come to South Carolina. Haley and Duane Parrish, Director of the Department of Parks, Recreation and Tourism, will pitch South Carolina tourism to a gathering of India-based travel media. “Steps to file an appeal on November 10 against death sentences to five innocent Tamil Nadu fishermen in the Sri Lankan SC are being made on a war footing,” a state government release said. State officials have been following up the issue with Central government officials on the orders of CM O Panneerselvam, it said. Best legal experts had been finalised by the Indian High Commission in Colombo to appear on behalf of the fishermen, the release added. RPI workers led by local leaders blocked road at Cadbury Junction and Eastern Express Highway, which connects the city with Mumbai, for over two hours, inconveniencing hundreds of commuters. 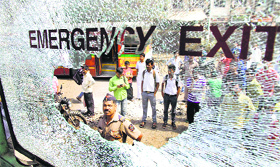 Nearly six buses of the Thane Municipal Transport (TMT), apart from some private vehicles, were damaged after agitators pelted them with stones in the afternoon, Thane police department said in a release. The protests were intense in localities such as Vartak Nagar, Shastri Nagar and Cadbury Junction. Shops and establishments in Vartak Nagar downed their shutters in protest against the ‘offending’ post. Nearly 50 RPI activists, including local leaders, were taken into custody by the police after workers marched on Vartak Nagar and Wagle Estate police stations and squatted there for over three hours demanding action against culprits behind the post. Police later released them. The four — one officer and three sailors — have been missing since 8 pm on Thursday when a Navy ship, a torpedo recovery vessel A-72, sunk 30 nautical miles (55 km) east off Visakhapatnam following an ingress of water. One person who died yesterday has been identified as Petty Officer James Jacob, 24. “A full scale search and rescue (SAR) operation is in progress,” the Navy said today. The search is going on in an area 80 nautical miles (148 km) south and south west of Visakhapatnam. This has been done to factor in the prevailing drift and sea currents. Though no missing personnel have been found till this afternoon, one Handycam (a video-camera) and two life jackets (belonging to A 72) were recovered yesterday from the search area, indicating the intensity of the search operation. A board of inquiry headed by a Captain is in progress to investigate into the circumstances leading to the mishap. Navy Chief Admiral Robin Dhowan has cut short his official visit to Seychelles and has arrived back in India, he is expected to be in Visakhapatnam on Sunday. The Admiral was scheduled to be in Indian Ocean island country till Sunday. Each of the nine warships looking for the men has special abilities. One has divers and diving equipment, another one has powerful underwater sonars, two of these have high-speed abilities to rush to any spot and almost all of them have onboard helicopters. Deputy Superintendent of Police Ploster Syiem, who was leading an operation against Karbi militants at Moolaber along the border of Assam’s Karbi Anglong district, sustained injuries in his left arm when Assam policemen opened fire, Meghalaya Director General of Police Peter J Hanaman said. Assam policemen who had reached the area ahead of their Meghalaya counterparts, opened fire mistaking the latter for militants, Hanaman said.